Well hello March. After what felt like the longest January known to man I can't believe how quickly February flew by. Due to our recent home improvement work the month was mainly spent painting and decorating and assembling flat pack furniture. But the house is starting to look really fantastic. We all have new bedrooms now and it feels like a fresh start for our house. And I am hoping that spring isn't far away - spring is the season of fresh starts and positivity I reckon. The sun is shining right now so here's hoping it sticks around for a while, makes us smile and warms us up a little. I bought these daffodils a few days ago and yesterday they were ready to be photographed. I love spring flowers. 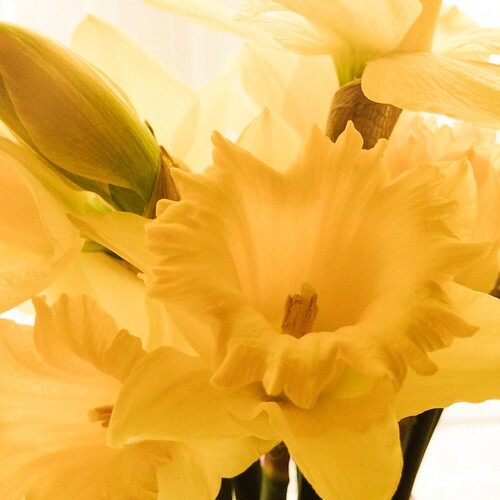 And I love how you can pick up a bunch of daffodils for £1 and instantly bring a little bit of sunshine into your home. I might have to brighten up the house with some tulips soon too.